Brookmere | British Columbia ROCKS! Brookmere is a very small community with no services, located in the Nicola country. This area abounds with ranches and farms and is rich in recreation for hunting, hiking (part of the Trans Canada Trail between Hope and Princeton), ATV’s and motorcycles and snowmobiles in wintertime. Of course sight seing is a great passtime as well and this area does not let you down. Brookmere (named after a local rancher) was founded as a divisional point on the Kettle Valley Railway. Something alot of people have never seen before still exists in Brookmere. 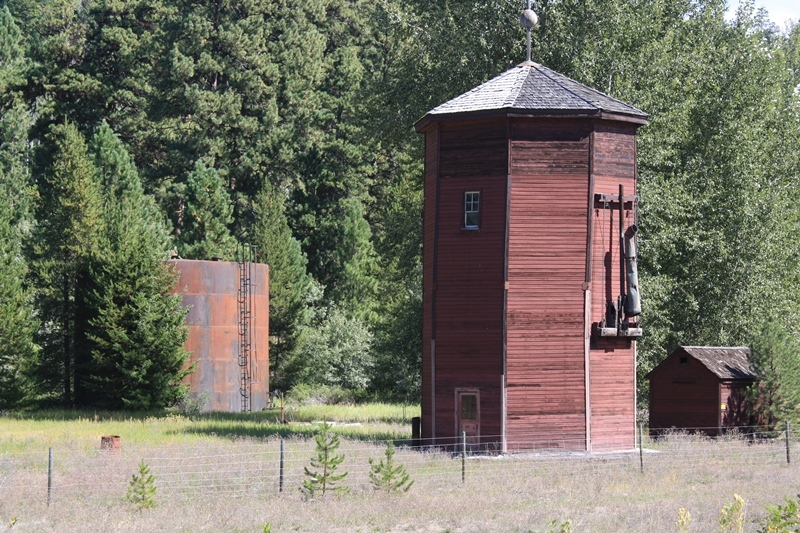 Likely one of the very last remaining railway water towers is still standing and in pretty good condition. There used to be other railway buildings here which included a roundhouse but they have all disappeared because of fire. Access to Brookmere is off the Coquihalla Highway at the Coldwater exit. Explore the area it is amazing what you may stumble upon. Learn more about this marvelous province! This entry was posted in British Columbia and tagged british columbia, brookmere, coquihalla highway, kettle valley railway, nicola, steam engine, water tower. Bookmark the permalink.